Last week my PC went down and in the emergence of work that i have to do, i want to buy a PC quick, without the necessity to think the specification. I had a couple of things in my mind when i want to buy the PC. First, it has to be energy efficient, it had to be cheap and it had to be durable, because my pc went on around 20 hours a day. i was thinking to build my own specification for the pc but the budget that are available at that time are only $450 and the time was not sufficient. After careful thought in choosing the right PC, i stumbled upon a great bargain branded PC, HP Compaq CQ2030L at bhinneka.com for $419. I choose this because compared with building the PC by myself with the compaq specification it makes around $390, it still a bit pricey but considering that it is branded and uses intel Atom 230, i’m sure that it’s durable and very energy efficient, the uses of Intel Atom that coined me the PC with the term green PC. The things that interested me the most is that the package that are offered by Bhinneka was bundled with an 18.5inch wide Compaq LCD and HP Deskjet 1550, The LCD will surely help me in coding but unfortunately for the printer, is that i’ve just bought a new printer and scanner last month, so i gave it away the printer to my relatives. The first time i hand on the PC, i was quite shocked of how small it is because it’s my first time using a thin PC like this. I’ve done a couple of research before i bought it, one of them is the PC only consume less than 100watt of electricity, the processor itself is only 22watt max. When the package came, i asked to the delivery guy, is there a Windows XP driver on the box? the guy answer, there’s none. That’s when the first problem came, i was intended to install win XP on the PC but there’s no driver at hand and no PC at my house, later then the delivery guy promise me that it’s not a problem, i can ask the technician at Bhinneka to help. Felt relieved by the promised, i’ve knew that i can count on the help of the technician at Bhinneka. But boy do i was wrong about it, i sent a polite email to care@bhinneka.com to guide me to the location to download win XP driver. After three days with no response (no autoresponder too), i knew that i can’t expect help from them, so i had to search it by my self. After googling, i found the driver at HP but only for Windows VISTA. Such a crap moment, knowing pretty sure that the PC itself couldn’t run Vista smoothly, but the HP only provide VISTA driver for that type. After googling a few hours more, i’m pretty sure there’s no other site providing the driver. So i went back to HP.com and tweak the keyword and found the driver. The driver i get is from the Compaq CQ2000 type, the CQ2030L type is for Indonesian only and doesn’t provide XP driver. Everything went smoothly with the CQ2000 driver, It runs really well on XP sp2. 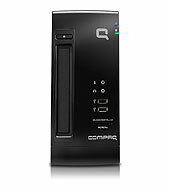 if u want to download HP Compaq CQ2030L driver for Windows XP u can download it here. So how is the performance of the PC? it runs everythings smoothly, right now at the time of the writing, the programs that are running is notepad++ with 8tabs, Firefox with 9 tabs and 8 add-ons, Xamp Server (httpd & mysqld), Comodo firewall and antivirus, password manager and download manager. Is there any hiccups? nope, there’s none. Does it runs Adobe photoshop? or illustrator? yes, but i only test it with Adobe CS2. I’ve runs photoshop with Firefox, notepad++ and Xamp server, there’s not a single hiccups. i use the photoshop to edit 3000×4000 res photo. the system runs smoothly. All in all, the PC fulled up to my expectation, the only things that i don’t try with this PC is playing 3D games which is not the first thing it was intended.